This hand out photo shows the fiberglass shell found in the high seas where a Navy Dvrora Fast Attack Craft was destroyed yesterday. Here's a detailed Sri Lankan military's account of the mine-warfare ongoing in Mullaitivu. The island is very close to the Rama Setu and Indian coastline, situated as it is at a distance of only 40 kms. from Point Calimere (Kodiakkarai). The report refers to LTTE Sea Tigers operating from Nagarkovil (India) down through Chempiyanpattu, Chalai, Mullaitivu up to Kokkuttoduvai. Govt. of India should take immediate notice of the ongoing mine-warfare too close to the nation's coastline and suspend the Setu channel project IMMEDIATELY, without waiting for the Hon'ble SC to continue their deliberations. Mine warfare is such a serious issue that it took 6 months of mine-sweeping by US, Australian, German, British and Netherlands Navies to clear the stretch of 20 kms. in Persian Gulf and declare the Gulf safe for navigation (in the wake of the Desert Storm operations in Kuwait). One shudders to imagine the nightmare of such mine-sweeping or mine-hunting operations in the proposed mid-ocean channel passage in Gulf of Mannar and Palk Straits which is over 160 kms. long. Time for action is NOW in due consultation with security experts and all wings of the Indian army. National security is too serious and vital a matter to be held hostage to the dictates of petty and parochial, regional politics, coalition dharma notwithstanding. Citizens of the world should understand the devastating nature of mine-warfare on narrow straits and on high seas and demand that issues of national security cannot be decided without consultations with experts who have spent their lifetimes gaining the professional expertise needed in successfully mounting mine-warfare operations and counter-measures. Claims and counter claims have been made by the LTTE and the Sri Lanka Navy (SLN) over a pre-dawn incident that sank a naval Fast Attack Craft (FAC) yesterday in the northeastern coastal waters off Nayaru. The Navy has declared 10 of its men as “missing in action” (MIA), while six, including the Officer-In-Charge, Lt. Commander Goonewardene, were rescued after a search operation that lasted till 6:30 am. The LTTE claims it killed 14 sailors in the clashes, while conceding it lost three of its Black Sea Tigers- ‘Lt. Col.’ Anpumaran, ‘Major’ Niranjani and ‘Major’ Kaninila- “killed in action” (KIA). The SLN, which blamed the incident on a sea mine explosion, (See box story for types of sea mines) has denied clashes with the Tigers. It says that the aluminum hull of the craft was damaged when its latter part got caught in the explosion. The SLN questions the absurdity of the Tigers failure to kill the six crew members rescued several hours later. Some crew members got into the drifting life craft that is easily targeted, while the rest jumped overboard. Citing the rescued, the SLN states that the Tigers were nowhere near the scene. Naval sources, who say the explosion could have occurred by a drifting mine, a moored mine or, one at the bottom of the sea, however, have ruled out the use of diver-delivery vehicles, on board some of the ships destroyed by the SLN, not too long ago. In April 2007, SLN surveillance patrol craft operating in the eastern seas, detected some 24 sea mines placed by the Tigers. Naval divers called into action, claimed removal of all the sea mines in the Nayaru area, making it safe for the SLN and for fishing. Nevertheless, the SLN feels more have been planted since. A month before ‘Eelam War IV’ commenced on June 17, 2006, mysterious mid sea explosions were heard in the Pamunugama area, which the police claimed were magnetic mines laid by LTTE underwater divers. Later, there was talk of the LTTE having acquired or turned out submarines. The LTTE is known to spring surprises on the military. Four years ago, it took the ‘Karuna’ faction by surprise, by moving its cadres and heavy weapons across the Verugall river, to stage an attack on Good Friday, a day one would least expect such a move. Yesterday’s incident, again took place hours after Good Friday, which also happened to be Medin Poya. Generally, the Tigers are wary of giving any advantage to their opponents, and the moonlight would have removed the element of surprise, giving the SLN a distinct advantage. It is learnt that two SLN FACs were in the seas off Nayaru, some 15 km from Mullaitivu. The LTTE states that the ill-fated FAC was between Nayaru and Mullaitivu. If this is correct, the LTTE is trying to make out that the Sea Tigers reacted to the presence of naval craft in an area it still controls. The LTTE states that the fighting lasted 45 minutes, from 2:00 am., while the SLN says that the blast occurred around 2.30 am. State defence officials are of the view that the LTTE would not attack on a Poya Day when there is so much light. Further, they opine that suicide boats, originally manned by one member, now, have two members, one to fire weapons. But, experts say that a third could be used to obtain radar information. The LTTE has its observation points and radar points here. Meanwhile, the Defence Ministry reported SLAF fighter jets launched precision air strikes on a Sea Tiger base yesterday (22), 7km North of Nayaru lagoon in Mullaittiuvu at 11.15 a.m. The air strikes, according to the military, came amidst intense Tiger activity monitored in the area. The other FAC accompanying the ill-fated craft, had informed Eastern Naval Command, which, in turn, obtained assistance from Northern Naval Command, that dispatched several craft to the location. The two FACs, locally manufactured by Colombo Dockyard, were fitted with Israeli weapons systems. The SLN, with its sheer superior firepower and speed, had a distinct advantage over the Sea Tigers, which, however, has unmatchable weapons- explosives guided by the ‘misguided’ suicide bomber. That is why the coastal belt, from Thondaimanar to Madagal, is off bounds for fishermen, as the Tigers sometimes pose off as fishermen and strike. Six months ago, there was a major attack off Thondaimannar. Prior to that, there was an attack in the Kachchativu island. As ‘Eelam War IV’ commenced, the Sea Tigers used combined sea-land attacks to displace the military at Kilali. But, the Sea Tigers did appear somewhat subdued, after possible clashes within the LTTE hierarchy. The suspected rift between LTTE’s Sea Tiger Wing leader, ‘Col.’ Soosai and intelligence wing leader Pottu Amman, did not do the Tiger naval wing any good. There were less confrontations in the latter part of last year and early this year, despite the LTTE’s original claim that ‘Eelam War IV’ would be decided on the seas. The SLN successfully defeated the Sea Tigers, every time they took on the SLN or, bring in arms and ammunition. The pictures of smoldering Tiger vessels are still fresh in the mind. In all, the LTTE lost some 10 ships in the past five years. But, the military would not take chances with the Tigers, who are known to bounce back. The Palali military base, Kankesanthurai harbour, Karanaigar Naval base and Trincomalee harbour and their environs, have all been declared out of bounds for fishermen as the LTTE would often disguise itself to secure an advantage. During ‘Eelam War IV’, the SLN did well to in effectively implement a naval blockade along the eastern coast, as well as the northern coast, preventing the Tigers from bringing supplies from outside. The two possible supply routes are Mullaitivu on the northeastern coast and Vidatalativu on the northwestern coast. The LTTE, which has witnessed “close air support” given to ground troops by the Sri Lanka Air Force (SLAF), is possibly anticipating a sea-land operation by the SLN and troops in the northwestern coast. Army columns and “deep penetration units” have been moving through the Mannar jungles to wrest control of locations that would enable them to eventually capture Vidatilativu. The Army is keen on sea-land operations to maximise its efforts towards securing the northwestern coast, with Pooneryn as one important target. Securing and maintaining the Mannar-Pooneryn Road would essentially require the services of the SLN. A secure northwestern coast would enable the Army to face the enemy on one flank- eastern side of the road. This strategy is thought of as against securing the rest of the A9-Road, which has to be defended on two flanks on the ground. But, the thinking of the SLN may have been that the Sea Tigers were already anticipating a naval assault or a sea-land operation on the northeastern coast. 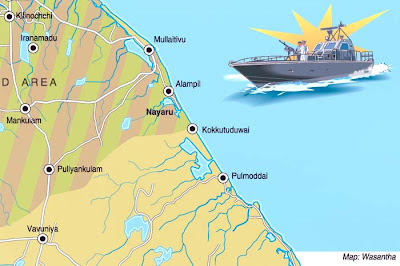 Hence, the possible patrol on the northeastern waters off Nayaru, close to Mullaitivu, to catch the LTTE off guard. Cutting off the northeastern Mullaitivu line of supply, may be an option the SLN may be toying with. The SLN controls the eastern seas from Pullmodai down through the Trincomalee, Batticaloa and Amparai coasts. The LTTE controls the coastal strip from Nagarkovil down through Chempiyanpattu, Chalai, Mullaitivu up to Kokkuttoduvai. The Tigers supply route has been from Mullaitivu through Kokkuttoduvai into the Manal Aru region, also called Weli Oya, where the Army’s recently created 59 Strike Division is trying to make headway. The army has been fighting the LTTE on several fronts in Wanni, Weli Oya and Jaffna. Last week, too, the army drew the LTTE into confrontation and attacked LTTE’s first line destroying bunkers. The Mechanised infantry, with its extra fire power, and the mobile infantry with its fire power, hit the Tigers hard. The aim is not to secure land at this stage, but to get them to confront. But, there was an unusually late monsoonal rain that was not there last year or the year before. The rains have saved the day for the LTTE. Army Commander Lt. Gen. Sarath Fonseka visited Jaffna yesterday (22) and met senior ground commanders as clashes between Security Forces and Tigers took place in Muhamale and Nagarkovil areas. Maj. Gen. G.A. Chandrasiri, Jaffna Security Forces Commander, who received the visiting Army Chief, at the Palaly airport briefed him on the security arrangements. Commanders of Divisions, Brigades and Units discussed the security situation in their respective areas. The Army claims it secured 11,000 recruits in January and February, and was bent on taking on the LTTE on several fronts, to exhaust the Tigers who are already overstretched. The LTTE’s Toppigala hideout secured in July last year, has provided an ideal terrain for training soldiers. When the Army was heading for Toppigala, one important strategy it adopted was to close the supply routes to Toppigala, which it did at Karadiyanaru. Closing the supply route would isolate the enemy. This is exactly what it is doing in the areas of Parappakandal in Mannar. Meanwhile, the Military announced heavy fighting between the Army and Tigers in the area southeast of Adampan, Mannar in a pre-dawn attack yesterday (22). The Media Centre for National Security (MCNS) claimed troops overran eight Tiger bunkers, killing over 22 Tigers and injuring more than two dozens in the lower Adampan area, considered the gateway to Vidutalatuivu. Troops are yet to reach Adampan town. There was no independent confirmation of the casualty figures, but the pro-LTTE Tamilnet website failed to report the incident. The MCNS, citing latest reports from the battlefront, said that troops gained considerable territory during the multi-pronged assault launched around 4:45 am. yesterday. “The advancing Army battle formations were assisted by heavy artillery and mortar fire directed at LTTE resisting positions,” states the MCNS report citing unnamed defence sources. Meanwhile, the MCNS adds that troops captured a square kilometer, following intense clashes with Tigers in the general area between Parayakulama and Ilanthaivan, in Mannar yesterday. The military reported four soldiers died and 16 wounded during the confrontations. Troops recovered five Tiger bodies, while search operations are on, even as troops were consolidating their defences. Army Chief Lt. Gen. Sarath Fonseka, who himself has fought in these places, as a commanding officer (CO), and is drawing up all plans in the current phase of the war, is directing the COs from Colombo as he knows the areas, like the back of his hand. But, nature has intervened to slow down the advancing troops, given the long bouts of incessant rain, retarding progress. The floods have also affected the people and ‘added insult to injury’ to the internally displaced people from the Musali Division of Arippu, Silavathurai and Mulikilam. The Mannar rice bowl and home gardens have also been adversely affected by the raging waters. Meanwhile, strategically, the Army has closed the Mannar-Medawachchiya, A-14 Road at the Mathavchaiy entry-exit point, for vehicles coming in and going out of the north to the south. The reason being to stem the flow of explosives to the South, on the understanding that all explosives are coming from the north. This means all goods- perishable and non perishable- coming from the north, have to be re-loaded into other lorries, increasing labour and transport costs, sending the prices of goods, both in the north and south, soaring. SSP Sisira Mendis, who served the Criminal Investigation Department (CID), for 30 long years including four years as the director of the department, was appointed DIG CID and is expected to overlook the Terrorist Investigations Department as well. He takes over from DIG CID D.W. Prathapasinghe, who has been transferred to Sabaragamuwa. After his transfer to the north as SSP Vavuniya for one year in 2007, the then SSP Mendis returned to the CID recently as its director, before being appointed DIG, overseeing the important unit of criminal investigations. Mendis is held in high esteem both within and outside the police force as an honourable and disciplined officer. Meanwhile, another honourable and capable officer in the police Nimal Lewke who has served the Special Task Force as its Commandant has been replaced by DIG K.L.M. Sarathchandra. DIG Lewke will, however, continue to serve as DIG Operations, Western Province. Previous attempts, by interested parties, to move Lewke out of the STF in August 2007 by appointing Senior DIG Mahinda Balasuriya as STF Commandant did not succeed. The latest rationale behind removing the war veteran from heading the STF was that he served in that position for four years. There have been precedents where the position of Commandant was held for over four years and the best example is DIG Karunasena. Among the new changes, approved by the National Police Commission, are: DIG Eastern Range, H.M.D. Herath; DIG Moneragala Operations Range, A. Goonetilleke; DIG North Western Range, P. Nanayakkara; DIG Ampara, R.P.S.K. Rajapaksa, DIG Central Range, Abeysiri Gunawardene; DIG Crimes, U. Hewage, DIG Training and Exams, A. Jayasinghe; DIG Recruitments, S. Michael; DIG Ombudsman, W.P. Dayaratne. The advantages of employing the sea mine include engaging an adversary at minimal risk to ADF forces; providing the possibility of delivering a pre-emptive defensive attack; engaging an adversary with a covert weapon that maintains a continuous threat; forcing an adversary to operate both military and commercial shipping in areas that make them more vulnerable to other weapons; forcing an adversary to maintain an MCM capability; and presenting an adversary with a significant psychological threat. The disadvantages of employing sea mines include the dangers to mine warfare vessels and friendly shipping, as well as the requirement, under international law, to clear away all mines after the conflict is over. The sea mine threat may be described under two main categories. Moored mines are positively buoyant, attached to the seabed, floating at a pre-determined depth below the sea surface, and are laid in water depths of up to 300 metres. Ground mines are negatively buoyant, resting on the seabed, and are laid in water depths of up to 200 metres against surface shipping or 300 metres against submarines. The two main sea mine categories can be subdivided into sub-types dependent upon their method of operation and actuation, as shown in the diagram above. If there was a lull in the battlefields of Wanni due to heavy rains, the fighting shifted to the high seas. Before dawn yesterday, six Navy Dvora Fast Attack Craft (FAC) were on patrol in the north-eastern seas in formations of two each. Two of the FACs were in the deep seas off Nayaru, which lies near the Tiger guerrilla stronghold of Mullaitivu. An explosion engulfed one of the locally-built Dvora (437) in a ball of fire. It sank immediately. The remaining Dvora rescued six sailors including its Officer-in-Charge but the fate of ten more on board the destroyed vessel is not known. Navy officials suspect the Dvora was destroyed by a sea mine. This, they say, is not conclusive and add that it could even be a human torpedo. One form of human torpedo is a suicide bomber strapping explosives to ram a vessel. Another form is a diver directing a floating or submerged device with explosives at a vessel. Last year, in the same general area, the Navy discovered sea mines. However, a senior official at Navy Headquarters in Colombo said, "we are yet to determine conclusively the exact cause for the explosion. Neither the crew of the second Dvora nor survivors from the one that was destroyed are able to say how it occurred. There was no exchange of fire. Nor do we have any electronic evidence." A further elaboration of this aspect, which would have helped one better appreciate the realities, is not possible due to serious personal constraints. Search operations in the high seas yesterday led to the discovery of a fiberglass shell, small pieces of plastic and burnt out polythene. 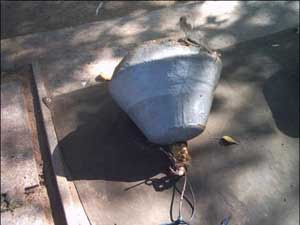 The fiberglass shell has led to suspicion whether quantities of explosives were hidden in it. Navy officials hope these items would give them a clue in determining the exact cause for the explosion and sinking of Dvora 437, an FAC built by the Colombo Dockyard. However, the Tamilnet website said the Dvora was destroyed after Black Sea Tigers attacked. This is what the report said: Liberation Tigers of Tamileelam (LTTE) elite Black Sea Tigers, engaged in a confrontation with a fleet of Sri Lanka Navy in the seas off Mullaiththeevu, attacked and sunk a SLN Dvora Fast Attack Craft (FAC) between Mullaiththeevu and Naayaa'ru at 2:10 a.m. Saturday, LTTE sources in Vanni told TamilNet. At least 14 Sri Lanka Navy (SLN) sailors were killed in the clashes, the Tigers said. Three Black Sea Tigers were killed in action in the fighting that lasted for 45 minutes from 2:00 a.m. Saturday. Meanwhile, SLN sources said 10 SLN sailors were missing. Sixteen sailors were on board the SLN said. “Vessel number of the sunk SLN Dvora FAC was 438, the LTTE said. “Lt. Col. Anpumaran, Major Niranjani and Major Kaninila were the Black Sea Tigers killed in action. If the Navy's suspicions that sea mines were the cause of the loss of the Dvora and uncertainty over ten of its crew members, it adds a new dimension to the ongoing Eelam War IV. The extensive use of such mines can impede naval movement in the high seas. That is not only confined to patrolling the seas. More importantly, the Navy provides the bulk of the security cover for movement of food and military supplies to some 40,000 troops and policemen deployed in the Government controlled Jaffna peninsula. They are transported from Trincomalee to Kankesanthurai. In addition, the vast majority of troops and police personnel are also escorted at sea by the Navy. However, such phenomenon is unlikely since sea mines have not been used in any other location in the recent past. On the other hand, senior Navy officials say that the placing of mines in the seas off Mullaitivu had been resorted to by guerrillas for another reason altogether. They say it is to stall any sea-borne assault on the shores of Mullaitivu or a beach landing in that area, which is considered the centre of power of the guerrillas. It is known that key installations of the guerrilla sea-going arm, the Sea Tigers are located along that coastal stretch. Heavy rains have further slowed the advance of troops in the main theatres of fighting in the Wanni. In the Mannar sector, where troops are advancing in two different flanks, one west and the other east of the Giant's Tank, there were only sporadic exchanges of artillery and mortar fire by the two sides. On Friday two soldiers were killed when guerrillas, who had infiltrated Mannar, triggered off a Claymore mine. The incident took place in the South Bar area. Troops attached to the Area Headquarters in Mannar had utilised three buses to bring members of the Buddhist clergy for religious ceremonies from a temple near South Bar because of Medin Poya. The Claymore mine missed the first but hit the second bus. A Captain and a soldier were killed on the spot. Six other soldiers were injured and four are in a critical condition. In the Weli Oya sector where troops have seized considerable extent of "no man's" land as a flank moved northwards, in the direction of Mullaitivu, heavy rains have converted the terrain into a marsh. Here again, sporadic exchanges of artillery and mortar fire continued. An Army official in the sector, who spoke on grounds of anonymity for obvious reasons, said in some areas the floodwaters were knee high. An unexpected development had been a sizeable number of troops falling sick with complaints of either dengue or Chickungunya. They have been hospitalised for treatment, he added. These developments came as the Ministry of Defence was engaged in major re-deployment of troops in the North and the East. As part of this measure, personnel of the Police Special Task Force (STF) are being re-located from camps in the Ampara district to the Vavuniya district. Similar shift of troops from Trincomalee district are also to follow shortly. Details of how the re-deployment will take shape cannot be revealed. Officially, the proposed changes are being dubbed as routine and necessitated by changing ground situation. In this backdrop, as the Eelam War IV continues, a formidable group of senior officers of the Army, Navy and Air Force, who are now retired, are at the forefront of a campaign to formulate a Defence Policy for Sri Lanka. They are made up of Retired Flag Rank Officers and others retired from the Armed Services. They have joined hands with the Organisation of Professional Associations in this endeavour. Last Monday, the Mess Hall of the Sri Lanka Army's Mechanical and Electrical Engineers (SLEME) in Colombo was the venue for a gathering of serving senior officers in the Army, Navy and Air Force. Some senior retired Majors General in the Army and one time top officials of the Air Force and Navy gave them presentations on different aspects. They were all enunciating the need for a Defence Policy. The fact that the Armed Forces officers had been seconded by their higher command to take part in the event came as official endorsement of the event though not the draft policy itself. Circulated among those present were a set of documents including the 41-page draft of 'A Recommended Defence Policy on Sri Lanka' (in September 2007) fomulated by the Association of Retired Flag Rank Officers (with the help of other retired officers) for the Organisation of Professional Assiciations (OPA). The draft report notes that Defence Policy is required to "determine the means by which, without impoverishing the nation, Security Forces could be deployed to fulfil the requirements of National Security." It says: "The Armed Forces are an extension of the 'political will' of the government. Today military thinking tends to be politico military and Foreign Affairs should be militarily diplomatic. Policies have to be tailor-made….."
"India is unlikely to indulge in a military adventure across the Palk Straits, unless Sri Lanka pursues a military solution sans a parallel 'hearts and minds' campaign with the Tamil population in the North and East. "An influx of refugees in large numbers to Tamil Nadu will encourage their sympathisers in that state to provide covert material and moral support to the LTTE. Such tensions may lead to India Navy/Coast-guard being deployed to deal with infiltration and intrusions, which could result in incidents of a military nature and strained relations," the draft points out. "Apart from the Defence Policy stated by the D.S. Senanayake Government in 1947, which was made non effective in 1956, (except the continuation of anti-illicit immigration operations until 1980) there has been no discernible "Defence Policy" enunciated by any government thereafter. "Ad Hocism" has been resorted to and some of the decisions, such as prevention of the build up of the Navy (personnel and equipment) for nine years proved disastrous in 1983 when RAW supported the influx of trained rebel cadres and ammunition to the Jaffna peninsula without a deterrent naval presence. "There were 'ad hoc' decisions on various occasions such as the provision of arms and ammunition to the LTTE and the premature removal of the Indian Peace Keeping Force (IPKF), which have been to the detriment of Sri Lanka's security. If there is a national policy on defence accepted by Parliament, such unilateral decisions detrimental of the security of the nation would not take place. "Even to date there is no discernible Defence Policy. The Defence of the Nation is left to the whims and fancies of those running the Defence establishments of the country whereas it should be of the highest priority for a government and the people who are sovereign must be made aware of the policy adopted for their security. "Many countries have adopted a policy of Comprehensive Security i.e. encompassing a variety of subjects which can affect the Security of the Nation (National Security). A few of these can include food security; health security; environmental security; the brain-drain; labour unrest, corruption and many others which can have an adverse effect on the country's stability. "Apart from the dangers to National Security caused by military attacks from within the state or from outside, these threats must be assessed by the highest authority constituting the National Security Council (NSC) as and when such threats are envisaged, and remedial measures should be adopted. Intelligence on these matters must be collated and presented to the NSC. The NSC must not be confined to military security alone but to all possible threats to the nation's stability and good governance. Any Minister under whose purview that particular threat is perceived. and economics) who could advise the NSC on the implications of the perceived threats and the remedial action to be taken. "The National Security Council (NSC) system is the principal form for deliberation of National Security Policy issues requiring the Head of Government's rulings. The NSC system provides the framework for establishing national strategy and policy objectives. The NSC develops policy options, considers implications, co-ordinates operational matters that require inter-departmental consideration, develops recommendations for the Head of Government and monitors policy implementation. "When a military situation is envisaged the Chairman of the Joint Chiefs of Staff discharges a substantial part of his statutory responsibilities as the principal military advisor to the government, the Service Chiefs should also be present in such a situation to tender specialist advice. The NSC prepares National Security guidance that should develop into policy. These policy decisions provide the basis for military planning and programming particularly in respect of capital equipment such as aircraft, ships and heavy weapons etc. "There has to be divisions of the Ministry (of Defence), one with a Civilian head (Secretary) and the other with a Military head (Chief of Armed Forces). The proper designation should be Chairman Joint Chiefs of Staff and not Chief of Defence Staff (CDS) as a CDS should be a person who has worked in all three services and be familiar with tri-service operations etc. One should not be subordinate to the other and each has specific responsibilities and the existence of the Defence Council will help to sort out any differences, which should not, but might occur. c. Chief of Air Staff"
It seems highly unlikely that the Government would be in a mood to formulate a Defence Policy, or for that matter, even effect defence reforms when it is now at war. Hence, the main priority will remain the conclusion of Eelam War IV. Whether a Defence Policy or reforms would then become as necessary as it is now will thus remain a key question. COLOMBO, Sri Lanka (Reuters) — Sri Lankan Air Force jets bombed Tamil Tiger strongholds on Saturday after a navy patrol boat was sunk by a mine rebels were suspected of planting off the northeast coast, with 10 of the 16 crew members missing and feared dead. Pro-Tamil sources said the fast attack craft was destroyed by a suicide squad of so-called Black Tiger fighters, with three rebels killed. But the military said the boat struck a mine around 2 a.m. on a patrol by two navy craft near Nayaru, about 185 miles north of the capital here. The pro-Tamil Web site, tamilnet.com, said rebel suicide fighters had destroyed the boat during a firefight that lasted up to 45 minutes, and said 14 sailors had been killed. Both sides regularly make conflicting claims. Their reports are impossible to verify because Nordic monitors who had been keeping watch over a shaky cease-fire left the island in January. They left after President Mahinda Rajapaksa formally scrapped a six-year truce in the country’s 25-year civil war, accusing the rebels of using the peace to rearm. The navy ship was the second sunk by rebels since then. The military has been intensifying its campaign against the Tigers, who are fighting for an independent homeland, pressing forward in their northern strongholds and aiming to defeat them by year’s end. But in a separate episode, two soldiers were killed and six others injured late Friday when their bus hit a Tiger landmine in the northwestern district of Mannar. The military immediately struck back, launching multiple bombing raids on Sea Tiger radar and command positions near Nayaru and Puthukudyiruppu, which may have played a role in the rebel attack. The military said they had also overrun Tiger positions near Parayanakulam, also in Mannar, killing 15 rebels in a strategically vital area. It said two soldiers had been killed. That brought the reported death toll last week to 158 rebels and 7 soldiers. About 70,000 people have died since the war began in 1983.